(a) This figure shows that a comparison of the distribution of matter is very similar on a large scale between wave dark matter, the focus of this research, and the usual dark matter particle. (b) This figure shows that in galaxies the structure is very different in the interpretation of the wave, which has been carried out in this research; the research predicts the soliton of dark matter in the center surrounded by an extensive halo of dark matter in the form of large “spots”, which are the slowly fluctuating density waves. This leads to many predictions and solves the problem of puzzling cores in smaller galaxies. 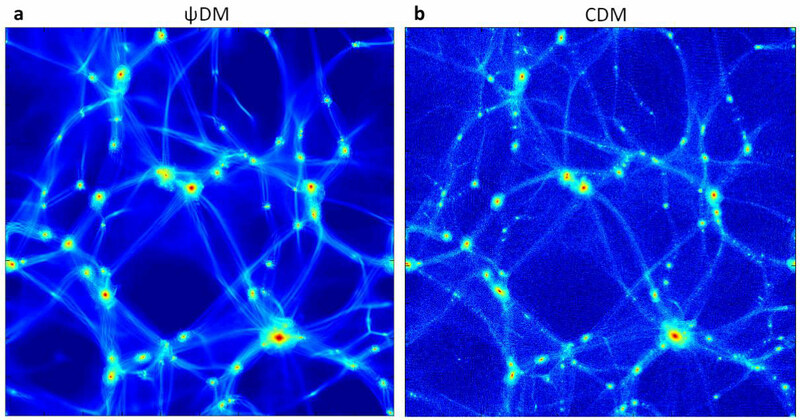 Newly published research signifies the reinterpretation of cold dark matter, opening up the possibility that it could be regarded as a very cold quantum fluid governing the formation of the structure of the Universe. 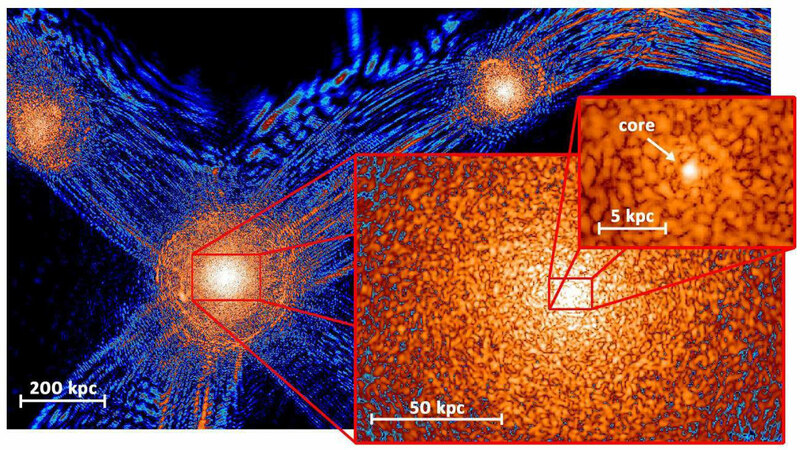 Tom Broadhurst, an Ikerbasque researcher at the UPV/EHU’s Department of Theoretical Physics, has participated alongside scientists of the National Taiwan University in a piece of research that explores cold dark matter in depth and proposes new answers about the formation of galaxies and the structure of the Universe. These predictions, published in the prestigious journal Nature Physics, are being contrasted with fresh data provided by the Hubble space telescope. This figure is a comparison of the radial density profiles of the galaxies which the researchers have created by displaying the soliton in the center of each galaxy with a halo surrounding it. The solitons are broader but have less mass in the smaller galaxies. 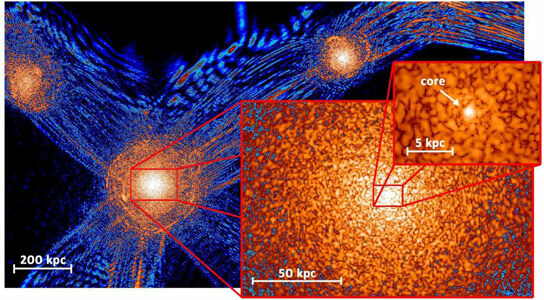 This theory can be used to suggest that all the galaxies in this context should have at their center large stationary waves of dark matter called solitons, which would explain the puzzling cores observed in common dwarf galaxies. The results are very promising as they open up the possibility that dark matter could be regarded as a very cold quantum fluid that governs the formation of the structure across the whole Universe. This research opened up fresh possibilities to conduct research into the first galaxies to emerge after the Big Bang. Tom Broadhurst has a PhD in Physics from the University of Durham (United Kingdom); until joining Ikerbasque he did his research at top research centers in the United Kingdom, United States, Germany, Israel, Japan and Taiwan. He has had 184 papers published in leading scientific journals, and so far has received 11,800 citations. In 2010, he was recruited by Ikerbasque and carries out his work in the UPV/EHU’s department of Theoretical Physics. His line of research focuses on observational cosmology, dark matter and the formation of galaxies. 4 Comments on "The Reinterpretation of Cold Dark Matter as a Bose-Einstein Condensate"
Dark matter constitutes about 24% and dark energy some 72% leaving just 4% for all the visible universe with galaxies and nebulae. We know pretty well that galaxies expand or rather pull apart by such dark matter and dark energy intervening in between them at fantastic speed nearing the velocity of light. This article deals with the micro distribution of such dark matter wielding a force on the galaxies as a wave with its core called soliton of Dark matter.It looks like the energy interweaving the whole universe making the visible stars and galaxies dance according to their tunes. Moreover it should be the maximum non-crystallized form of initial energy of Big Bang of the order of 10^19 Gev, still hanging over ready to be transformed into the matter in course of time in scales of billions of years to come.Thank You. But if the early universe was hot, then cold Dark Matter-Bose-Einstein Condensate would not yet form, it seems to me, until later when some places in the universe had cooled and allowed for DM/BE-condensate formation. But then it would not have had the effect of driving galaxy formation early on. It’s a puzzle for sure. Hello! Who gave you the concept of cold or hot with regard to the initial Big Bang Universe? Hot or Cold is only in respect of wavelength in the range of infra-red wave-length. Initial Universe was having energy of the order of 10^19 Gev, that this heat radiation is a microscopic part of its spectrum. But… remember that all other higher frequency or lower wavelength of the spectrum like X-Rays, Gamma-Rays, etc will interact with matter to produce heat, no doubt. Even light spectrum in LASER conditions can produce heat. Since Dark Matter or Dark Energy is fantastically large enough to produce galaxies to expand and speed up near the light speed, you should not conclude it and pack it as heat bodies. They are energy ensembles simply which I have already told in previous analysis that they may transform to ordinary light matter and visible universe step by step by their degradation. Thank You.